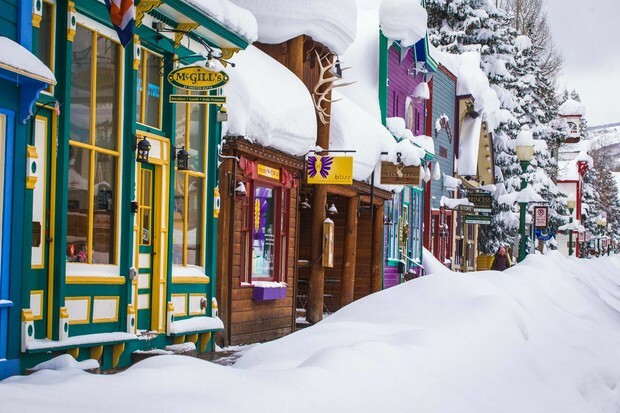 Crested Butte – the last great Colorado ski town. Trent Bona photo courtesy of the GCBTA. Like many Colorado towns, Crested Butte was once a coal mining town. Unlike many of those former mining towns, Crested Butte citizens have battled big mining companies for almost 40 years to protect Mt. Emmons – the Red Lady – from being mined. Even though our population is small, this town packs a big punch. When it comes to our way of life and the vast beauty that surrounds us, endless mountains to look at and unprecedented open space to adventure in, we are serious about keeping this town a recreation community first. When I tell people I live in Crested Butte, most people comment on how hard it is to get here. I feel it is neither good nor bad that people think or feel this way. 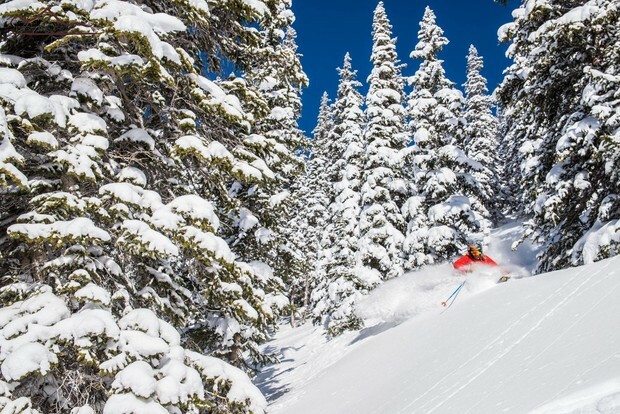 Good, because locals love the intimate, no-lift-lines slow-paced vibe; after all, there is good reason it is considered “The Last Great Colorado Ski Town“. Bad, because like all resort towns, we need visitors to keep our amazing businesses alive and kicking. Locals alone cannot support the economy, and tourism is our bread and butter. When this is the destination, how much trouble could getting to Crested Butte be? Photo courtesy of GCBTA. The funny thing is, I find Crested Butte not hard to get to at all – or maybe I am blinded by the fact that it is simply always worth getting to. It is roughly the same distance from Denver to Crested Butte as it is from San Francisco to Tahoe, which people drive every weekend without question. During the winter weekends, it takes Denver residents about the same time, if not more, to get to the ski resorts along I-70 (Copper, Vail, etc.) due to traffic. But here, Gunnison-Crested Butte Regional Airport is just 30 minutes away, and depending on where you stay, you don’t even need to rent a car. You can take the Alpine Express Shuttle to your destination and then use the Mountain Express town shuttle to or from Crested Butte Mountain Resort and throughout town. While Crested Butte sits just on the other side of the Elk Mountains from Aspen, Crested Butte marches to a totally different beat. It’s more laid back, yet has more festivals and reason to dress up than you can possibly imagine. The most unique reasons being Vinotok – a pagan festival that celebrates the fall harvest and which is loaded with wild costumes – Flauschink, Al Johnson, and then there is the Wildflower Festival in July, since we are officially the Wildflower Capital of Colorado. Largely devoid of Denver weekend traffic, Crested Butte is practically liftline-free. Photo courtesy of GCBTA. 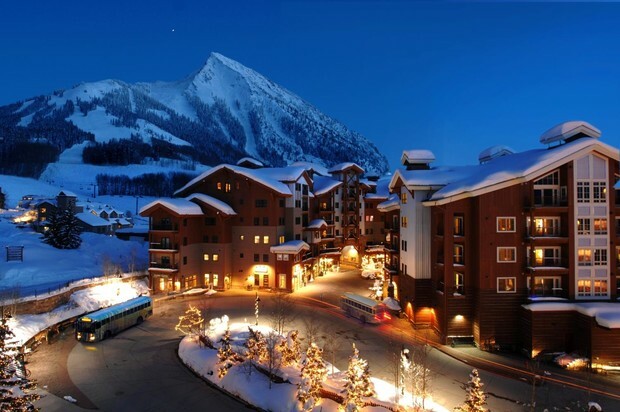 Crested Butte Mountain Resort (CBMR) is located on Mt. Crested Butte and overlooks the town of Crested Butte. Just like our town, it is small but spunky and offers a lot of variety. Of the resort’s 1,587 acres, 582 of it is called the Extremes. 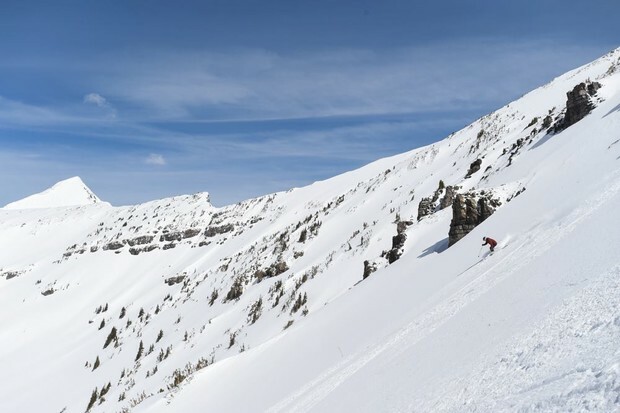 Many resorts have sidecountry or open gates to their more adventurous terrain, whereas Crested Butte has made this terrain inbounds and controlled for everyone to enjoy stress-free. The Extremes are located off The North Face Lift and The High Lift, which are both t-bars. These lifts access some of the steepest, most exciting terrain you can ski anywhere in the world. I was already a skilled skier when I moved here, but this terrain helped me take my skiing to the next level. Crested Butte is legendary for its steeps, and because of that, helped spearhead the big mountain ski movement in the '90s. Tom Runcie photo. Given the legendary terrain at Crested Butte Mountain Resort, it was only natural to be one of the areas to help spearhead extreme skiing in the US. In 1991, the resort first hosted the Crested Butte Extremes, and has consistently hosted the event since. A venue that is often revered as highly technical and very steep, Crested Butte has a way of highlighting those who can REALLY ski and ride. If your or another in your party is not up to skiing everyday, there are plenty of activities for them to do at the base of the mountain. They can play a round of mini golf, or enjoy the adrenaline rush of the tubing hill or the bungee jump on the deck of Butte 66, while you enjoy some smoked meat cook right on the premises. For those curious about what it takes to groom the mountain with an 18,000-pound snowcat, then try the bucket list experience of grooming your own run with CBMR’s snowcat driving experience. Irwin Guides offer a host of guided backcountry activities, including some of the deepest cat skiing in all of Colorado. Irwin Guides photo. Other winter attractions available are ice skating, snowmobiling, dogsledding, snowshoeing, and now winter biking on fat bikes. If you want to try a different way of sliding around on the snow, there is the Nordic Center, which offers endless miles of Nordic trails. 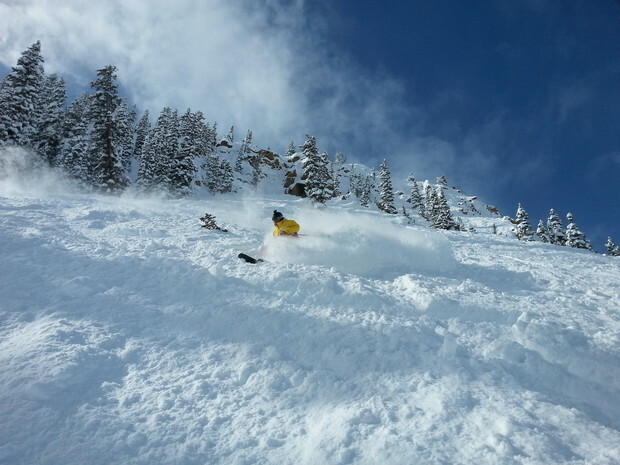 Irwin Guides offers more than just earning your turns for fresh backcountry powder. 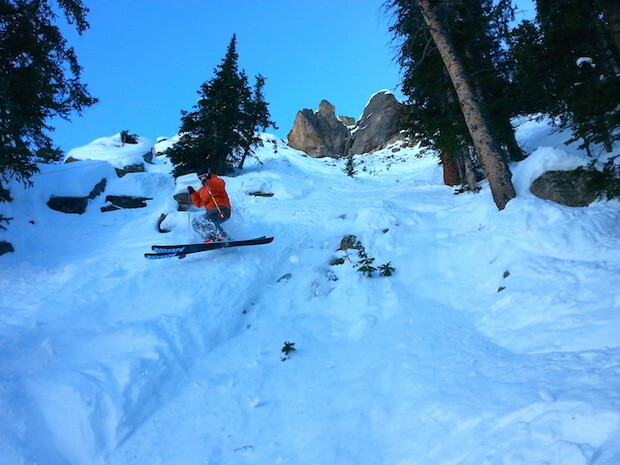 It also offers some of the deepest cat skiing in the state. Crested Butte has options right on the mountain, as well as in town. Photo courtesy of the GCBTA. The resort offers a wide range of lodging options from hotel rooms at the Grand Lodge, to multi-bedroom condos at the Lodge at Mountaineer Square, both of which are just steps away from the bus stop and the base of the lifts. Then there is the WestWall Lodge, which truly captures the essence of slope-side lodging with its location literally just steps from the WestWall lift. 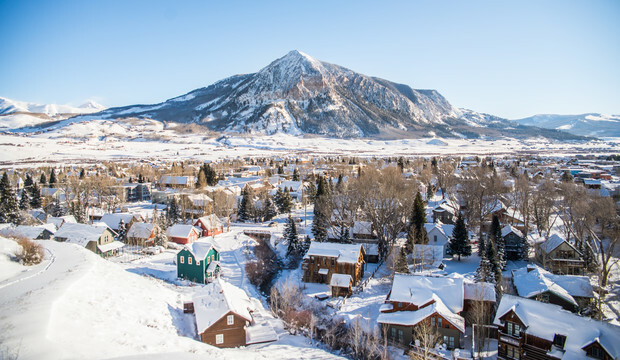 In the town of Crested Butte, you can find quaint lodging choices like the Purple Mountain B & B and the Elk Mountain Lodge, which is a historic miner’s lodge built in 1919 located just one block from Elk Avenue. Elk Avenue is Crested Butte's main drag, and has all the best restaurants right on it. Photo courtesy of the GCBTA. Elk Avenue is the main vein of Crested Butte’s National Historic District. This bustling street is almost entirely intact from the Victorian era and has more fine dining restaurants per capita than any other ski town. We eat well here! In the morning, stop by Camp 4 Coffee where locally roasted coffee is served in the iconic license plate cabin. Then eat a hearty gourmet breakfast before hitting the hill at the Sunflower. The Secret Stash is a Crested Butte destination, housed out of the old Company Store downtown. Secret Stash photo. The Secret Stash has become the staple of the downtown Crested Butte dining scene. 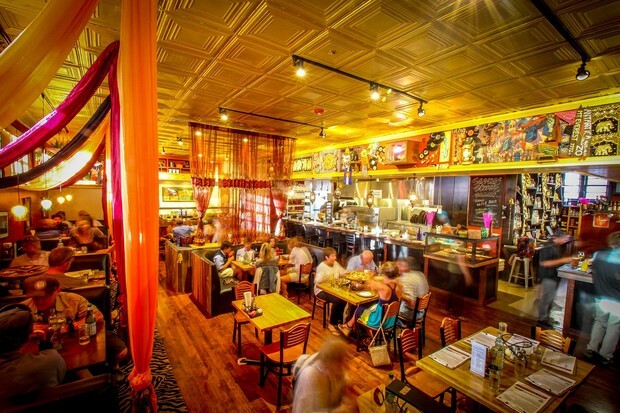 Creative Colorado-style pizza served up in a wildly energetic worldly décor has made the Secret Stash a destination for everyone visiting. 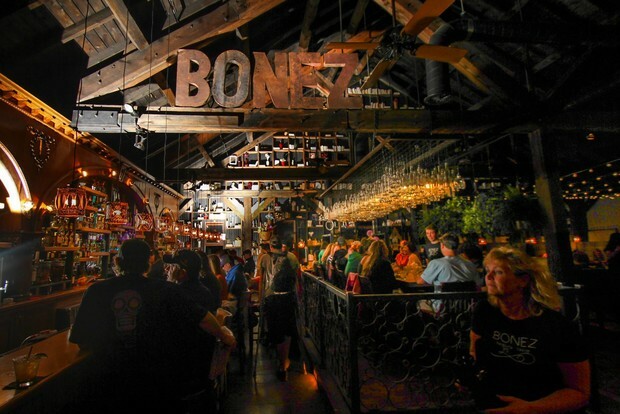 Bonez Tequila Bar and Mexican Grill has over 100 tequilas, hand-squeezed margaritas from strong to exotic (try the Mez-Scorpion, a pineapple jalapeño-infused marg with a smoky mescal floater), and fresh Mexican cuisine. The historic building combined with the Day of the Dead décor creates quite the sensory experience. Return to the Sunflower for farm to table cuisine and experience a dining experience like no other place. The Bonez Tequila Bar has over 100 tequilas lined up behind the bar to try, and wild Day of the Dead decor. Bonez photo. Pre or post dinner, do not miss our boutique drinking establishments. If you're looking for artisan cocktails, try the Dogwood Cocktail Cabin or Montanya Distillers, makers of award-winning American rum distilled right on site at their Elk Avenue tasting room. If you're more into a casual local's scene, the Talk of the Town is a great option and is where you dependably can start your own impromptu dance party. Rum isn't the only thing we make up here in these high mountains. Romp is a local ski manufacture that produces custom made skis, this includes your pick of flex, camber, and rocker tuned for each skier. Additional options include ultra light weight carbon fiber backcountry skis, Countervail® vibration reduction, and custom graphics. If you want to see how it is all done they offer free tours of their 100% wind powered factory.